It was the match of the weekend in La Liga as Valencia were set to host Barcelona at Mestalla Stadium. In fact, the occasion was so big that thousands gathered around Valencia’s bus as it travelled into Mestalla. The fans sang and cheered. They knew how big this match was and the kind of form their side are currently in. Here were Valencia, 12 weeks in, under new manager Marcelino, and they were currently unbeaten, their best ever start in their history. Just prior to kickoff, only four points separated them from first place Barcelona. This was their chance to show just how far they could push La Liga’s most in-form team, a team that has become more reliant on Lionel Messi than ever. Building up to the match, however, most of the talk was about Marcelino’s ban from being on the touchline for this crunch fixture, and if Ernesto Valverde’s decision to leave Messi on the bench during their 0-0 draw against Juventus in the Champions League would make a difference. As it happened, the match finished with a final score of 1-1. On the scoreboard, the match was defined by Goncalo Guedes’ perfectly weighted pass to meet Jose Gaya’s overlapping run down the left side which resulted in the young Spanish left-back finding Rodrigo with a direct pass for the tap-in. With that play in mind, what your local TV pundits won’t tell you about that goal was that it’s a good reference and situational tool to show any young or professional centre-back as a similar situation they might come across. We’ll get more into that later. Anyway, Barcelona, with the brilliance of Messi, of course, equalized later on the second half with eight minutes left when the Argentine genius bent a perfect pass over Valencia’s backline and found Jordi Alba for the equalizing volley. And Barca desperately needed it, as they were making quite a few poor decisions with the ball in the second-half for many stretches of play. Tactically, however, this match tested both sides’ strengths and weaknesses. And that, of course, is why you’re here. So let us get into it. Valencia, rather unsurprisingly, stuck to their 4-4-2 which operates as more of a 4-2-2-2 in attack, and were largely looking to defend for most of the first-half and transition to attack quickly. Their defensive system didn’t have as many pressing triggers or precise screens for certain situations as Atletico Madrid did when they faced off against Barcelona earlier this season, but Valencia were certainly focused on protecting their penalty area, winning the ball in deeper areas to catch Barca on the break, and generally favoring containment over pressing, especially their forwards. Barcelona, on the other hand, were predictably going to look to dominate possession and try to pull Valencia’s low and mid-blocks out of position. A common strategy was to overload the right side in a 3-5-2/3-6-1 and switch the play to the underloaded side where Jordi Alba could take advantage of more time and space. In addition, Andres Iniesta would drift all the way to the wing during these switches of play to link with Alba. However, there were other characteristics of Barcelona’s build-up strategy and attacking-half possession formation that we need to mention. To put it simply, the Catalan giants played with a very fluid and tactically flexible 4-4-2 of sorts. Barca’s 4-4-2/4-3-3 starts out as very rigid in terms of how they build-up into Valencia’s half. Barca moves the ball horizontally, from center-back/pivot to full-back or vice versa, with Valverde giving a license to his center-backs (primarily Samuel Umtiti) the option to dribble forward up from the back if the situation or space permits, usually upon a switch of play when the opposing defense has to shift over to the ball-side. Now, below, we see an example of Barca’s 4-4-2/4-3-3 build-up and how it shifts to a 3-6-1/3-4-3 variation when the Catalans enter and are comfortable in the attacking half of the pitch. Above, you can see Barca’s 4-3-3 formation. Also, we see that Sergio Busquets (blue circle) is in his usual defensive midfielder position. However, pay attention to that as well, as his position will change. Next, about 15 seconds later, we see the ball being passed over to Umtiti, switching the play to Barca’s right half-space, with Barca still in their 4-3-3 and Busquets still in his natural DM position. Soon after, Umtiti (blue circle) will dribble the ball forward as he has a decent sized window to bring the ball into the attacking-half. A couple of seconds later, we see that Messi has dropped deeper in the attacking-half and has the ball. As you can see, once Barcelona commits more bodies into the attacking-half comfortably, there is a clear switch from a four-at-the-back system to a three-at-the-back, with Busquets playing in a centre-back position. But, there is some flexibility to Busquets’ position. In the same phase of possession, only with Umtiti bringing the ball forward again some seconds later, we see the three-at-the-back system is still there with Busquets in it. This means that this is more than just Busquets reacting to a certain situation or something Valencia was doing. This was most likely a team tactic implemented by Valverde, of course. Also, above, you can see Paulinho next to Messi in midfield. Pay attention to Paulinho, too, his position will be fluid as well. Next, a few moments later, we see that Valencia has managed to push Barca back and has isolated the midfield and forwards from Paulinho and Umtiti. Also, above, you can see that Paulinho now has become the pivot. He’s now the link between the backline and the midfield. Anyhow, this pressure by Valencia forces Umtiti to pass to Busquets. Next, we see that Busquets, who took advantage of the fact that Valencia’s forward pairing was not eager to press him or the rest of Barca’s backline, went into the space between Simone Zaza and Rodrigo and passed an overhead ball to Nelson Semedo. Why did Busquets leave his backline? 1. He knows Valencia’s midfield gets compact when the ball reaches the central axis. This frees up Semedo down the right wing. 2. His passing range is better than Paulinho’s. He’s still the main passer for finding harder-to-reach switches of play. 3. Again, Valencia’s forward pairing of ZaZa and Rodrigo were not very aggressive at pressing Barca’s three centre-backs and Busquets saw a big enough space and time between the pairing to pick out Semedo. With that said, Barcelona has always been a fluid side in regards to position. However, Busquets being put between his two centre-backs in the attacking-half or near the midway line is uncommon. This type of role for Busquets is more common when trying to build up from the back against certain opponents in Barca’s defensive half. But, it is clear Valverde thought, given Valencia’s extra negative and compact defensive approach that perhaps putting Busquets between both CBs, and giving him the license to roam vertically, was the best option at getting the veteran Spaniard to find dangerous spaces. As mentioned above, Valencia were keen on really smothering the middle of the pitch and winning the ball by suffocating the space available to Barca. Per usual, as it is in the modern game, Barca’s passes to wide players triggered more intense marking as defending near the touchline is easier than defending in the central areas where there are likely more options for the side with the ball to pass out of pressure or trouble. Anyhow, it should be noted that Valencia didn’t really transition from mid-block defensive blocks/traps into touchline presses really looking to push Barca back or force turnovers in Barca’s half. In particular, Valencia’s forwards were looking to work with their midfielders, screen Barca’s midfielders, and close down potential windows of space. Below, we can see Alba passing backward to Paulinho. 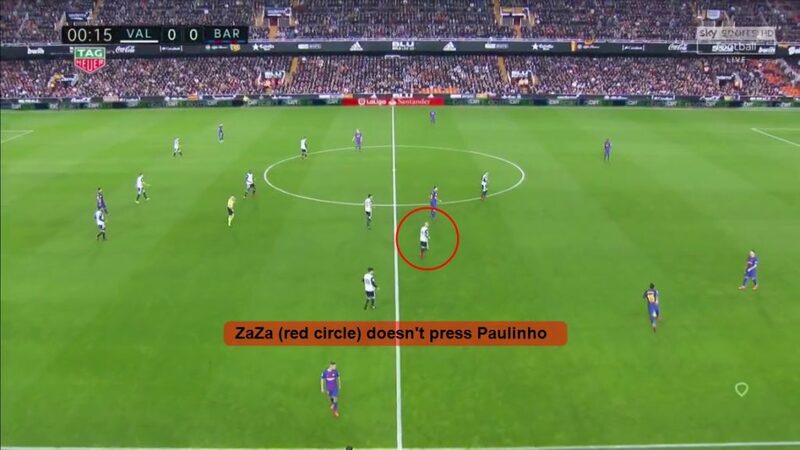 However, Zaza (blue circle) doesn’t press Paulinho like many other forwards would in this situation. Instead, he stays closer to his fellow midfielders and contains. Above, as the Brazilian midfielder dribbles closer inside, ZaZa still doesn’t press to take away time and space, he stays closer to his midfield. Next, we’ll look at some of the characteristics of Valencia’s low and mid-blocks. Below, we can see Barca’s right side overload (Valencia’s left side) with Messi turning and cutting toward the central axis. Above, you can see how narrow and compact Valencia’s midfield is. That is how they dealt with some Barca overloads. Furthermore, both of Valencia’s forwards stay in line with their own wide midfielders and stay compact. This, of course, forces Barca to switch the play. Now, this brings us to Valencia’s backline. Notice how much wider they are compared to their midfield. 2. The most important reason: they need to be ready to anticipate the switch and being compact would require them to travel a longer distance to shift over thus giving Barca more time and space (not good). In the next mid-block phase, we can see just how negative and compact Valencia wanted to be. Below, we see Umtiti passing the ball up to Semedo and Valencia’s Rodrigo (blue circle) dropping deeper to stay compact. Of course, Valencia’s midfield is compact as well. However, as Ivan Rakitic drifts to a further advanced position, he drags Geoffrey Kondogbia with him. This triggers Luis Suarez to drop into the open space that Kondogbia left. Luckily for Valencia, Kondogbia was quick to react and picks up Suarez in midfield. As the ball is then passed back to Umtiti, Valencia pushes up. But just before that, Rodrigo dropped deep to stay compact with his midfield and, whether on purpose or not, ends up screening a potential passing lane between Umtiti and Suarez. Lastly, as the ball made its way back to Busquets in that back three, Valencia push up and get compact with great timing and positioning. Honestly, with how negative Valencia were in the first-half in terms of really not pressing in certain moments and frustrating Barca, I’d say going into the locker room at the half with a score of 0-0 was a great position to be in. Marcelino’s men came out in the second-half in a much more aggressive manner. They high-pressed in a very man-orientated style and were more intense in mid-block phases as well. They wanted to force turnovers higher up. 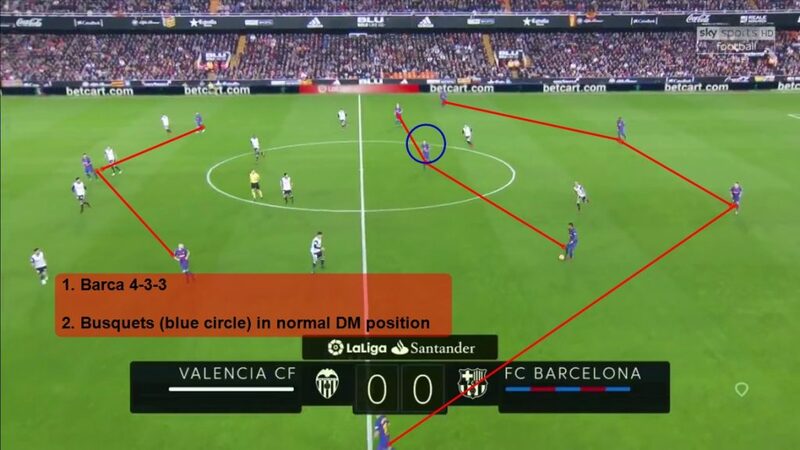 However, I won’t break down the style or strategy of Valencia’s second-half press because there’s something else that happened in the second-half that could benefit coaches trying to educate and improve their center-backs’ positioning. Let’s dig in. Samuel Umtiti’s positioning on Rodrigo’s goal and how to react to a ball getting behind the defense from the 18-yard line. Now, this particular play, where the ball is switched to a winger or full-back with more space and time out wide, and the ball ends up behind the defense, is common. And, that is exactly what happened when Rodrigo scored at the 60th minute. However, Umtiti could have made a positional adjustment and prevented the goal. Above, we can see the play starting to take place with Guedes about to receive the ball. Next, we see Rakitic covering the space on the edge of the 18-yard box between Semedo and Umtiti. As Guedes begins to challenge Umtiti, Gaya starts to make an overlapping run, below. As Gaya then overlaps, Guedes delivers a perfectly weighted pass in stride, and Rakitic doesn’t track the overlapping run. But here’s another tough decision to make. Had Rakitic tracked Gaya’s run before Guedes passed it, Guedes may have decided to take-on Umtiti as the French center-back would have had less cover. Either way, Rakitic’s indecision, in this case, isn’t the end of the world. Next, we see that Gaya enters the penalty box. Gaya then decides to put the ball between Umtiti and Marc-Andre ter Stegen and straight into the goal box. Above, you can also see that Umtiti positioned himself as if anticipating a cutback pass toward the penalty spot instead. This is where many coaches would perhaps feel as though he should have stuck to what he can control and that is the space just ahead of ter Stegen inside the goal box. Below, we see a close up of Umtiti anticipating Gaya to pass toward the penalty spot and cutting back trying to cut away the angle. Instead, he should have stayed in line with the ball. This tiny mistake would hardly warrant the coach chewing out the player, but this type of play where the ball gets behind the defense is very common and this scenario is one any coach reading this can use to recreate in training to improve a centre-back’s ability to read the situation. Anyway, this match ended, as stated above, with Alba equalizing due to Messi’s brilliance. However, there were times where Barcelona’s desire to play effortless possession-based football was cut short by poor and avoidable turnovers. It was when then happened that Valencia got a few chances in transitions from defense to attack for a good 20 or 30 minutes in the second-half. Nonetheless, Valencia proved their highly negative approach, especially in the first-half, can force teams to push forward with unbalanced possession formations out of desperation to find any source of creativity. I think this is where Marcelino wanted to get Barca and it worked. The 1-1 draw isn’t a bad result for Valencia.